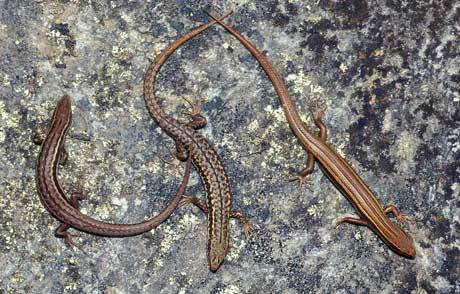 Two McCann’s skinks (Oligosoma maccanni) and a subspecies of the common skink (O.nigriplantare polychroma) (right) bask on a sun-warmed rock in Central Otago. Before 1990 they were thought to belong to a single species, known as the common skink, and believed to be widespread throughout New Zealand with a Chatham Island subspecies. Research since then has led to the reclassification of the common skink as five distinct species.